From Newark up to Goole was a flat trundle alongside the Trent. Pleasant cycling on a warm morning, but the Danube it's not. 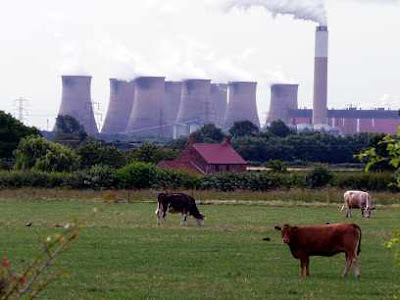 The Trent valley consists largely of power stations - you keep expecting the Super Mario Brothers to pop up out of the cooling towers - relieved by the odd high-security mental institution. I hope that today is the nearest I ever get to Rampton, but the way things are going, you never know. 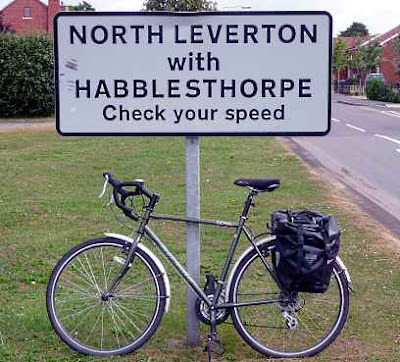 En route I went through the village with the biggest sign in the land: North Leverton with Habblesthorpe is, according to the Guinness Book of Records in the days when they listed such things, the longest place-name in Britain. 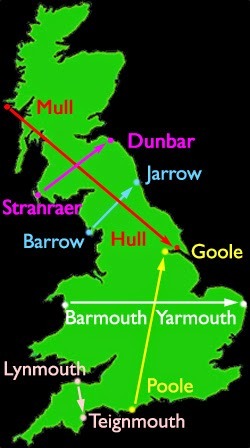 Finally arrived at Goole, which is every bit as good as it sounds. The purpose-built port town at the orifice of the Humber was opened, along with its canal and docks, in 1826, and has gone pretty much downhill since then. I arrived at 2pm and set out to explore all the highlights the town had to offer. I took a train to Ferriby at 2.12pm. Did you visit North Leverton (without Habblesthorpe) windmill? John Noakes once helped repair the sails there, and it has never stopped grinding corn throughout its long history. The website says: "Guided tours by a friendly miller are available on request". My mum used to work as a Speech Therapist at Rampton prison on Wednesday evenings in the 1970s until one of the inmates exposed himself.